The cooncil has been on Strike for two days, I haven't, though I did manage to get Wednesday off as a flexi day before the ban, so I did a JF a favour and did her late summer atlas tetrads for her. The two tetrads were side-by-side near Raylees, south of Otterburn, well inland for me but I survived, only getting a nosebleed at Winter's Gibbett. It was quite windy but ok for counting birds. There were lots of mipits and skylark, highlights were two family parties of wheatear, a family of stonechats, buzzard and reed bunts. 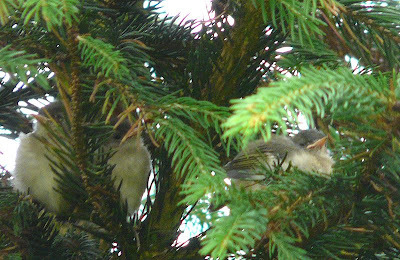 Best of all though was a a recently fledged family of goldcrests, I saw three of the fluffy youngsters perched in the tree, though more were calling from the wood, I would reckon at least six judging by the amount of calling when the adult arrived with food. Called at Druridge tonight, trying to dodge the showers, other than an arctic skua offshore, nothing much to report, I guess the birds were dodging the showers too.